Since the 1970s when crime became a problem in the City of Detroit the owners of businesses have taken drastic action to keep thieves from breaking in their buildings. Buildings now have windows on the lower floors filled with concrete blocks or glass bricks. Many have the same protection on upper floors. This situation presents a problem when a fire occurs. Entry to get to the seat of a fire is difficult and dangerous. If Firefighters have to make an interior attack they are at risk because they will be working in an area with limited escape opportunities. 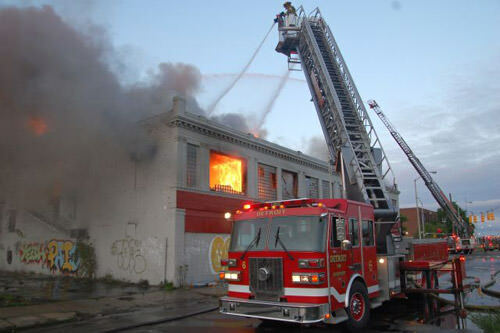 Take a look at the fire Detroit Firefighters responded to on May, 9th,2009. 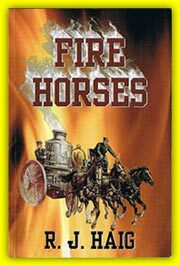 Notice the hard work involved in breaching the walls to get water on the fire. 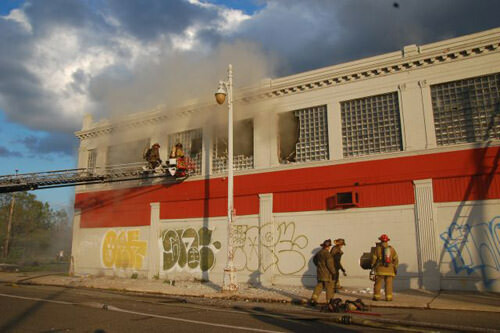 This was apparently an arson fire because the Department had to return the next day in the wee hours of May 10th,2009 to fight another fire set by the arsonists. Notice the openings made the previous day which made it easier for Firefighters to fight the fire. The officers in charge did a good job of bringing the blaze under control and making sure everyone went home without injury. 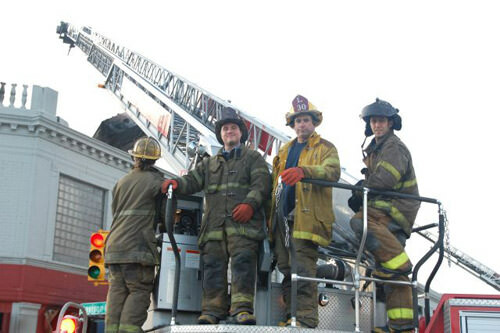 On Saturday, May9th, 2009 8th Battalion Companies responded to a fire at 1300 Joseph Campau and East Davison. 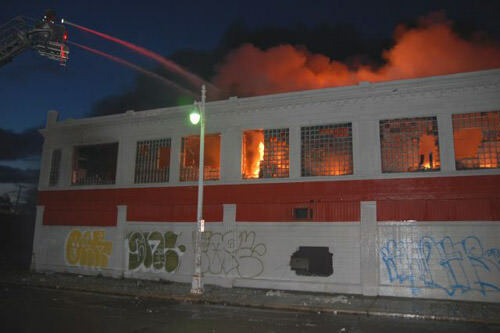 On arrival Engine 56 stretched on a vacant 250x150 two story commercial building. Chief 8 reported the fire as doubtful and requested an extra engine, a platform, and a squad. 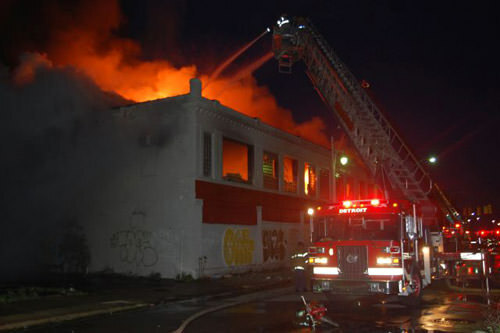 The fire soon required second alarm companies. 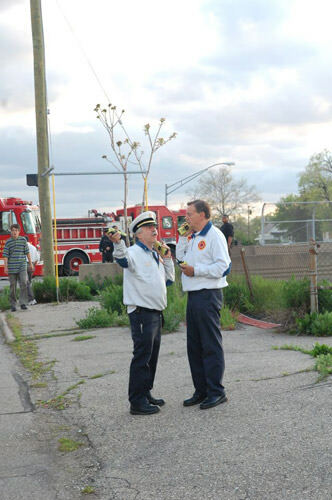 Orders from Chief 8 were to fight the fire defensively. The fire originated in the basement and extended throughout the building. 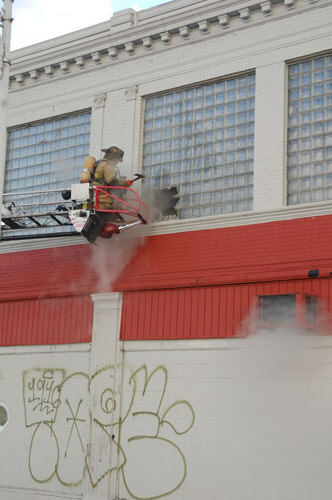 Companies operated for 6 hours and utilized relief units before the fire was extinguished. On Sunday, May 10th the same fire units responded to the same building and were once again engaged in a second alarm fire. The fire was brought under control with 5 engines pumping and using 3 water towers and one platform. A job well done at a dangerous building.